(COLUMBUS, Ohio) — The combination of former Secretary of State Hillary Clinton (president) and former Gov. Ted Strickland (Senate) as a Democratic “ticket” atop the ballot here next year would be a throwback. That’s not intended as a catty reminder that both Clinton (69 on Election Day 2016) and Strickland (75 on that same date) are older candidates. Rather, it’s just an observation that the places where they have run strongly in Ohio in the past are different from the places that powered President Obama to two Buckeye State victories in 2008 and 2012. Historically, the winning Democratic formula in Ohio was to rack up big margins in Northeast Ohio — particularly in Cuyahoga County (Cleveland) — win Lucas County (Toledo) and Montgomery County (Dayton), and perform relatively well in some of Ohio’s Appalachian counties that run along the Ohio River (effectively Strickland’s old congressional district, which ran from just south of Youngstown in the Northeast all the way to the state’s southern tip). The maps below, showing Jimmy Carter’s victory in Ohio in 1976 and Bill Clinton’s win in 1996, roughly demonstrate the pattern. Note: These maps are from the excellent Dave Leip’s Atlas of U.S. Presidential Elections, where he uses red for Democrats and blue for Republicans. I’ll be using these maps throughout the piece, so adjust your eyes accordingly. Note: Counties won by Democrats are in red, counties won by Republicans are in blue. In his comfortable reelection in 1996, Clinton did something that no Democratic nominee had done in Ohio since Lyndon Johnson in his 1964 blowout: carry Franklin County, home of the state capital, Columbus. This was a harbinger of things to come. In Republican statewide and national presidential victories in 2000 and 2004, Franklin County voted for losing Democrats Al Gore and John Kerry, and for the latter it wasn’t close: Kerry won Franklin County by nine points while losing statewide by two. Notice that in these two elections, shown in Map 2, Gore and Kerry performed worse in Southeast Ohio than Clinton did. For reference, the big, now-typically Democratic counties outside the Northeast are easy to pick out on the 2004 map: Franklin (Columbus) is the red spot in about the middle of the map, Montgomery (Dayton) is west of Franklin, and Lucas (Toledo) is the lone red county in the Northwest (it looks a little bit like a boomerang). Obama’s path to victory was different than those traveled by Carter or Clinton. For the first time since Johnson in 1964, a Democrat united the state’s three most significant urban counties, Cuyahoga, Franklin, and Hamilton (Cincinnati, the county in the state’s southwest corner), under his party’s banner. Obama did so again in 2012. Those wins are shown in Map 3. As was the case in other similar parts of the country, Obama did poorly in Appalachian Southeast Ohio compared to previous Democrats. The only county he won twice was Athens, home to Ohio University (my alma mater). Athens is solidly Democratic although it was one of the few places in the country to back Richard Nixon in his 1968 victory but then switch to campus favorite George McGovern in his blowout loss to Nixon four years later (Washtenaw County, home of Ann Arbor and the University of Michigan, is another). Southeast Ohio doesn’t have a lot of voters. 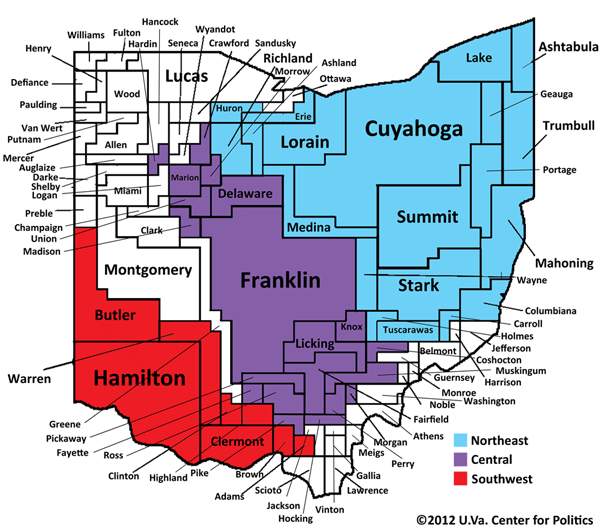 Here’s the political map of Ohio, which sizes the counties based on their population (and the colors are used to identify the main regions, not election results). In 2012, those Southeast Ohio counties — that small sliver of white in the map’s lower right — cast only about 5% of the total statewide vote, although one can argue that the definition of the region should be more expansive and stretch further north (we’re using the definition of the region as used by the Ohio Politics Almanac, a great resource). Obama lost the region by seven points, actually not that bad compared to Kerry’s four-point loss eight years prior, although the fact that Kerry did better there in a loss than Obama did in a win is a clear sign of the region’s trend away from Democrats. So is the fact that, in 1996, Bill Clinton beat Bob Dole in these same counties by 15 points, more than doubling his six-point statewide win. Hillary Clinton, as she gears up for a likely presidential bid, and Strickland, a Clinton ally who seeks to challenge Sen. Rob Portman (R), both have reason to believe that they can squeeze more votes out of Southeast Ohio than Obama did. As mentioned above, this is where Strickland is from, and he did relatively well in the region in his two-point reelection loss to Gov. John Kasich (R) in 2010. Clinton, meanwhile, saw her husband do well in the region in the 1990s, and she romped there in her 2008 primary triumph over Obama. She got at least two-thirds of the vote in all 14 Southeast Ohio counties except for Athens (she very narrowly carried the collegiate county). In Map 6, Clinton is in red and Obama is in green. Note: Counties won by Hillary Clinton are in red, counties won by Barack Obama are in green. Clinton won nearly everywhere except in the state’s three dominant counties — Cuyahoga, Franklin, and Hamilton, which together will cast about 30% of all the votes in next year’s presidential and Senate contests and, as mentioned above, were so vital to Obama in his two victories. If one wants to argue that Clinton’s primary victories in Appalachia signal some kind of 2016 strength in this region compared to Obama, one also has to reckon with her relative weakness in Ohio’s three biggest counties. Likewise, Strickland’s performance in all three of these counties was markedly worse than Obama’s, although it’s important to remember that he was running in the midterm years of 2006 and 2010, so turnout was smaller and different. But even then, Strickland lost Hamilton County while winning more than 60% of the vote statewide in 2006 against his weak Republican challenger, then-Ohio Secretary of State Ken Blackwell (who, it should be noted, is from Hamilton County). Strickland then lost Hamilton to Kasich by about four points in 2010. In 2012, Obama got 69.3% in Cuyahoga and 60.5% in Franklin, and those two counties accounted for 21.8% of the state’s total vote. In Strickland’s two-point 2010 loss, he got just 60.6% in Cuyahoga and 53.1% in Franklin — lower than Obama twice and Kerry in 2004 — and those counties’ share of the total vote was slightly less, 20.7% of the vote. The point of this long exercise is simply this: Obama won Ohio twice in part because he maximized his vote in the three largest Ohio counties — three counties where Clinton (granted, in a primary) and Strickland (granted, in midterm years) have shown weakness. Some Democrats worry that Strickland won’t be able to gin up the needed enthusiasm in these areas to win the state, even in a presidential year. It’s fair to say that Democrats, nationally, have the same worries about Clinton, at least when it comes to driving the black turnout that boosted Obama in key states like Ohio, Pennsylvania, and Virginia. It’s reasonable to question whether the Clinton-Strickland combination is as good a fit for Democratic turnout in the state as Obama and Sen. Sherrod Brown (D-OH), a more obvious liberal than Strickland, were in 2012. One can fall easily into the trap of talking about counties in a statewide race the same way one talks about states in the Electoral College. Unlike in the presidential race, where winning a state by one vote means in nearly all cases getting 100% of that state’s electoral votes, in a statewide race the difference between losing a county by one vote or winning a county by one vote is, simply, a net difference of two votes. However, if Clinton/Strickland can’t get Obama/Brown-level turnout in the state’s other big urban counties, they will have to make up those votes in other parts of the state if they wish to replicate the statewide victories by Obama in 2008 and 2012. And there’s an extra challenge for Strickland, which has to do with the man Strickland ultimately hopes to defeat, first-term Sen. Portman. Portman has a noteworthy advantage over Strickland: He is from Hamilton County. One would not expect a ton of crossover voting in the state’s presidential and Senate contests next year: This is a partisan era and Portman does not possess the statewide name ID and reputation of his predecessor, Sen. George Voinovich (R), a former governor who rolled over an underfunded opponent in 2004’s close presidential year. Strickland probably got in this race in large part because he thought Clinton was running for president and that if she carried Ohio, he could get over the finish line, too. It’s not an unreasonable hope. But Strickland is probably going to have to make up for some Clinton-Portman votes in Southwest Ohio: Sources on both sides in Ohio expressed skepticism that Strickland could beat Portman on the incumbent’s home turf. While Obama will not be on the ballot in 2016, he will be in the White House, and Appalachia has reacted poorly to his presidency. He won only 7% of Appalachian counties in 2012, compared to 68% for Carter in 1976 and 47% for Clinton in 1996. This antipathy toward Obama has bled down the ballot, and even if one compares the Carter/Clinton maps to the Gore/Kerry ones above, the area was trending away from Democrats before Obama arrived. West Virginia, the only state that is 100% Appalachian as defined by the Appalachian Regional Commission, has dramatically moved away from Democrats over the course of Obama’s presidency even down the ballot. Former Rep. Nick Rahall (D, WV-3), who was effectively the last true Appalachian Democrat anywhere in the House, convincingly lost his bid for an 20th term last year while Republicans easily elected their first U.S. senator in six decades (Shelley Moore Capito) and took control of the state House and Senate for the first time since the late 1920s. Virginia Sen. Mark Warner (D), who had a close call for reelection in 2014, made a national name for himself as a “NASCAR Democrat” during his early political career, which included an unsuccessful Senate run in 1996 and a victory in the 2001 gubernatorial race. Map 7 shows, on top, his 1996 Senate contest against then-Sen. John Warner (R), which the Democratic Warner lost by about five points. The bottom map shows Mark Warner’s reelection in 2014, when he won by about a point. Just as a reminder, the colors remain reversed: the Democratic counties are red, and the Republican ones are blue. Warner’s support collapsed in western Virginia, although working the region over the years did allow him to do a bit better than the president: Warner got 38% in Virginia’s southwestern Ninth Congressional District in 2014, according to calculations by Miles Coleman of the Ace of Spades HQ Decision Desk (a right-leaning site that does excellent work analyzing elections). Obama, meanwhile, got 35% there in 2012. If Warner can do poorly in Appalachia despite past success, doesn’t it stand to reason that Strickland could too, given the trajectory of the region? Democrats can argue, accurately, that Strickland is actually from Appalachia, and Warner is not. Perhaps that helps, and Republicans are well aware of Strickland’s past appeal in the region: They’ve been hitting him aggressively as insufficiently pro-gun and pro-coal, an indication to Democrats that their rivals are worried about Strickland’s rural appeal. Sherrod Brown also did slightly better than Obama did in the region in 2012, which was enough to win him a few counties that Obama lost even as they won almost the exact same percentage of votes statewide (Brown did 0.1 points better overall). Maybe Clinton can help in Appalachia too, but if recent history is any sign, her primary performance is not really going to be predictive of a possible general election. So we’re left with two, interrelated questions. Can Clinton and Strickland do significantly better in Appalachia than Obama did, and can they do as well in the big urban Ohio counties as Obama did? The answer to those questions might not just determine the presidency, but also control of the Senate. Thus far, I’ve written this piece under the assumption that Ted Strickland will be the Democratic Senate nominee in Ohio and Rob Portman will be the Republican nominee. That probably will be the case. Although some conservatives huffed and puffed when Portman endorsed gay marriage in early 2013 — a few days before Hillary Clinton did, it’s worth noting — there’s no real indication he will face a credible primary challenge. But Strickland does have a primary opponent: Cincinnati City Councilman P.G. Sittenfeld (D). Seemingly everyone but the candidate himself expects him to exit the race before the primary, but the 30-year-old has thus far forged ahead. The state Democratic Party has not endorsed in the primary, although the state party commissioned a Public Policy Polling survey showing Strickland and Portman tied, while Sittenfeld was losing to the incumbent by 19 points. It’s hard not to interpret that as anything other than a knock on the insurgent. New party Chairman David Pepper, a former Hamilton County commissioner who lost a close race for state auditor in 2010 and a not-so-close race for state attorney general last year, finds himself in something of a difficult spot as this primary develops. Pepper considers Strickland a political mentor, and Pepper himself is a mentor of Sittenfeld. That said, much of the state’s party infrastructure has united behind Strickland, including Sen. Brown, three of the state’s four Democratic members of Congress, and the Democratic Senatorial Campaign Committee. It’s not clear whether a primary would be good, bad, or otherwise for the party. Ohio Democrats have had bad experiences both ways in recent years. Strickland and much of the party establishment supported then-Lt. Gov. Lee Fisher (D) the last time this Senate seat was contested. Fisher defeated then-Ohio Secretary of State Jennifer Brunner (D) in the primary but then ran a dreadful race against Portman, who was easily elected to replace George Voinovich (R), who retired. In 2014’s gubernatorial race, the state party coalesced around then-Cuyahoga County Executive Ed FitzGerald (D), who had no real primary opposition but ran an even worse race than Fisher did four years prior. Sittenfeld can point to some historic inspiration for his challenge. In 1968, another Democrat who had at one time held a Cincinnati City Council seat scored a primary upset by defeating Sen. Frank Lausche, a former governor, in the Democratic primary. That challenger, John Gilligan (D), lost the general election to William Saxbe (R), who later served as U.S. attorney general in the last days of the Nixon administration. Gilligan would go on to be elected governor in 1970, and he became one of the most consequential chief executives in state history despite serving only one term. The comparison is inexact, to say the least. Lausche was a very conservative Democrat: Some have argued, credibly, that current Gov. Kasich is the most conservative person elected Ohio governor since Lausche. Labor loathed Lausche and heavily supported Gilligan in the primary. Strickland has no problems with labor, which plays an outsized role in the state’s Democratic establishment. However, Sittenfeld could go hard after Strickland on some issues, particularly the latter’s support of gun rights. Additionally, Strickland is hardly a beloved figure among certain important Democratic constituencies, such as African Americans, for whom Strickland’s rural appeal has no value. The councilman is also from the right part of the state, Hamilton County (turf he shares with Portman), if one believes that the county is becoming quite important to Democratic statewide chances. But it’s fair to say that Sittenfeld would need a lot of luck to even make the primary a contest, let alone win. Sittenfeld has upset some party regulars by reportedly promising that he would not run against Strickland and then, after Strickland got in, staying in the race. It seems unlikely that he’s doing any damage to himself by continuing on, at least at the moment: There’s plenty of time to make nice with the party bigwigs if Sittenfeld wishes to do so. And, if anything, the Ohio Democratic Party is in need of future stars. It doesn’t hurt to have an impressive young candidate making the rounds statewide. But as the primary approaches, Sittenfeld will feel more and more pressure to exit the race. And by crossing Strickland, Sittenfeld probably also crosses the Clintons, given how the national Democratic apparatus has united around Hillary Clinton’s all-but-declared presidential candidacy and how close Strickland is to the Clintons. Sittenfeld says he is in the race for good, but there is an escape hatch if he wants it. Sittenfeld was elected to a full term on the Cincinnati City Council in 2013 that runs through 2017. So whatever he runs for next year is a free shot — he doesn’t have to give up his seat. Sittenfeld is reportedly raising a fair amount of money, $500,000 or more. He also lives in Rep. Steve Chabot’s (R, OH-1) congressional district. Given that it’s another federal race, Sittenfeld could use his funds to take on Chabot if he wanted to. The district is hard — Romney won it 52%-46% in 2012 and it’s specifically gerrymandered to elect Republicans after Chabot briefly lost it in 2008 — but it’s also not an unwinnable seat. The 2016 Senate contest is the state’s main event, other than the presidential race, but there’s already a lot of chatter about Ohio’s statewide executive offices, all of which will be open in 2018 because their Republican occupants will be term-limited out of office. Brown will also probably seek a third term that year. Expect a lot of Republican primary action statewide. As of now, former senator and current Attorney General Mike DeWine (R) and Secretary of State Jon Husted (R) are likely gubernatorial candidates — though there’s seemingly room for a more right-wing candidate in that field given that DeWine and Husted are hardly Tea Partiers — and Treasurer Josh Mandel (R) seems very likely to gear up for a second run at Brown after his poor 2012 campaign, when he ran a few points behind Mitt Romney thanks to a third-party candidate in a race that otherwise largely mirrored the presidential contest. With no statewide officeholders other than Brown and a single justice on the ostensibly nonpartisan state Supreme Court, Democrats don’t have a lot of obvious candidates to fill out the 2018 slate. Sittenfeld could very easily be part of that Democratic lineup. But as of now, he sounds as though he’d prefer not to wait.